Chelsea boss Maurizio Sarri has played down fears over the injury blows his side have suffered in attack, with Willian the latest to pick up an issue. The Brazilian ace was forced off in the goalless draw with Southampton on Wednesday night, joining Olivier Giroud and Pedro in the treatment room. Given Chelsea are already struggling for goals, bagging just 38 in 21 Premier League games so far this season to give them the lowest scoring tally of the top six sides, the last thing that the Blues need is to be without key options in attack. 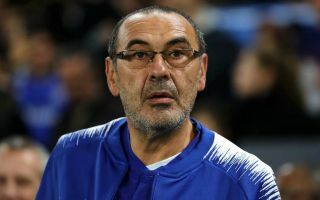 However, as noted in his post-match comments below by freelance injury analyst Ben Dinnery, Sarri has eased fears over the setbacks suffered by his players and insisted that all three aren’t expected to be ruled out for long. Willian’s injury was deemed “not really very serious”, while both Pedro and Giroud are tipped to return to training in the coming week or so. That could turn out to be a crucial boost for the Italian tactician as his side face Tottenham in the League Cup semi-finals this month, while there is also FA Cup action and a trip to Arsenal in the Premier League as the two London rivals battle it out for a top four spot this season. With that in mind, Chelsea could certainly do with all their key players fit and healthy to feature, and so it remains to be seen how long it takes for the trio in question to make a full recovery.